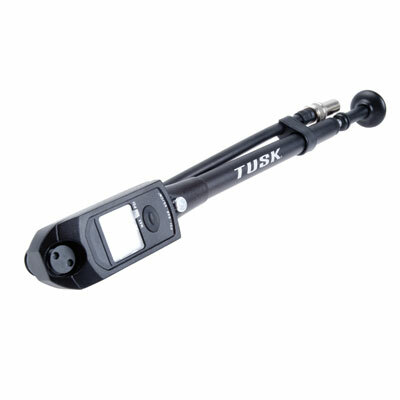 The Tusk Digital Suspension Pump makes setting suspension air pressure easy and accurate. This pump is a must for the motocross bikes coming with air forks. It also works on other motorcycle and mountain bike forks and shocks. This suspension pump measures air pressure from 0 to 300psi and makes adjustments easy with the large LCD display and micro-adjust air bleed button. Quality construction with a 6063 aluminum barrel and rotating hose that features a swivel head to fit Schrader style valves. Quality air pump for motorcycle air forks makes setting pressure easy and accurate. Also works on a variety of motorcycle and Mountain bike forks and shocks. 0-300psi range with large LCD display to show pressure in 0.5psi increments below 100psi and 1.0psi increments about 100 PSI. Micro bleeder button makes setting desired pressure easy and fast. 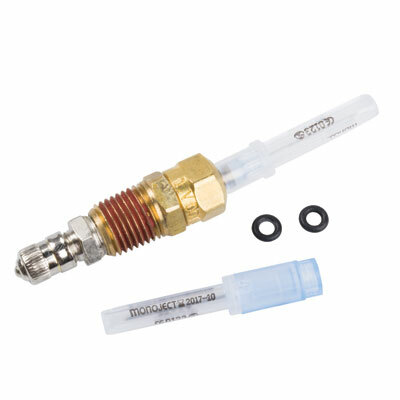 Flexible, rotating hose with a swivel head for all Schrader valves. Auto start and shut-off for long battery life - battery is replaceable (CR2032). Quality construction with a 6063 aluminum barrel. Kit includes Race Tech Shock Nitrogen Needle. 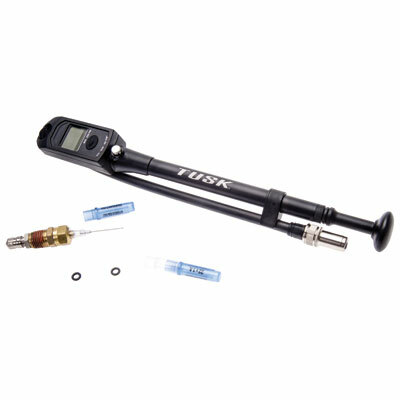 This tool is designed for gas charged shocks with self-sealing type rubber valves.